Ship's Computer: [advertising bodysuits] Try blue, it's the new red! WALL.E: [showing EVE bubble-wrap and popping a bubble] Pop! Ship's Computer: Hoe-down: A social gathering at which lively dancing would take place. Captain: [AUTO appears near the captain] AUTO! Earth is amazing! These are called "farms". Humans would put seeds in the ground, pour water on them, and they grow food - like, pizza! Captain: Psst - Computer, define "dancing". John: [WALL-E is looking for EVE and bumps into John, turning off his display] What-what the? AUTO: [Auto has just shown the Captain directive A-113, which is a message not to return to Earth due to rising toxicity levels making life unsustainable] Now, the plant. Captain: No wait a minute, Computer when was the message sent out to the Axiom? Captain: That's... That's nearly 700 years ago! Auto, things have changed. We've gotta go back. AUTO: Sir, orders are do not return to Earth. Captain: But life is sustainable now. Look at this plant. Green and growing. It's living proof he was wrong. Captain: What? It's completely relevant. Captain: Out there is our home. Home, Auto. And it's in trouble. I can't just sit here and-and-do nothing. Captain: That's all I've ever done! That's all anyone on this blasted ship has ever done. Nothing! Captain: I don't want to survive. I want to live. Captain: [groans in frustration, then turns around and notices that Auto is looming closer in the portraits of his predecessors. AUTO looms close behind him making him tighten his cap] I'm the captain of the Axiom. We are going home today. Captain: Wait, that doesn't look like Earth. Where's the blue sky? Where's the-the grass? 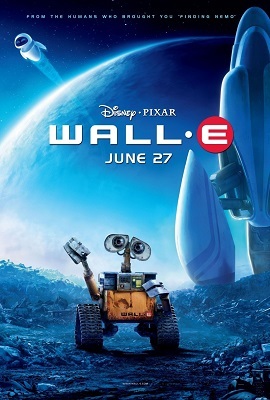 WALL.E: [Points to EVE] EE-va? Mary: Oh, yes, of course. Excuse me. Mary: I-I didn't know we had a pool! Captain: AUTO, you are relieved of duty! Captain: [Auto has confined him to his quarters] Stupid wheel! Voice in commercial: [a commercial appears as a hologram when WALL-E passes nearby] The jewel of BnL fleet; The Axiom! Spend your five year cruise in style: Maided on 24 hours a day by our fully automated crew, while your captain and autopilot chart a course for non-stop entertainment, fine dining; And with our all-access hoverchairs, even grandma can join the fun! There's no need to walk! The Axiom - Putting the "star" in executive StarLiner! Shelby Forthright, BnL CEO: [appears on the screen] Because at BnL, space is the final "FUN-tier"! Captain: 12:30? AUTO, why didn't you wake me for morning announcements? Honestly, it's the one thing I get to do on this ship. Captain: Well, good morning, everybody, and welcome to day 255,642 aboard the Axiom. As always, the weather is a balmy 72 degrees and sunny, and, uh... Oh, I see the ship's log is showing that today is the 700th anniversary of our five year cruise. Well, I'm sure our forefathers would be proud to know that 700 years later we'd be... doing the exact same thing they were doing. So, be sure next mealtime to ask for your free sep-tua-centennial cupcake in a cup. Wow, look at that. MO's computer: [after scanning Wall-E screen says 100%] Foreign contaminant! MO: Huh? Whoa-whoa-whoa whoa whoa! Captain: [Standing in front of a hologram of the plant from EVE's camera] Haha! Look what I got, AUTO! Captain: [chuckles] That's right, the plant. Oh, you want it? Come and get it, blinky. Ship's Computer: [after the "uhh" echoes] Accepted. Captain: We'll see who's powerless now! WALL.E: [M-O has finished cleaning a severely damaged WALL-E, who strains to give a handshake] WALL-E.
MO: [M-O scrubs WALL-E's hand, then shakes it] M-O. Ship's Computer: Time for lunch... in a cup! Shelby Forthright, BnL CEO: [Shelby appears onscreen in an old classified recorded message] Hey there, autopilots. Got some bad news. Um... Operation Cleanup has, well uh, failed. Wouldn't you know, rising toxicity levels have made life unsustainable on Earth. Captain: [to himself, looking at healthy plant] Unsustainable? What? Shelby Forthright, BnL CEO: Darn it all, we're gonna have to cancel Operation Recolonize. So uh, just stay the course, um... Rather than try and fix this problem, it'll just be easier for everyone to remain in space. Shelby Forthright, BnL CEO: [overlapping] Uh, I think - huh? Okay, I'm giving override, uh, Directive A113. Go to full autopilot. Take control of everything, and do not return to Earth. I repeat, do not return to Earth. Shelby Forthright, BnL CEO: Let's get the heck outta here. EVE: [EVE repeats "Directive" in multiple languages, ending with... ] Directive? EVE: [Eve turns away, sharply] Classified. Mary: [Mary is looking at the stars outside the Axiom while other passengers pass idly by] Oh! So many stars! Ah. Captain: This is called farming! You kids are gonna grow all kinds of plants! Vegetable plants, pizza plants. Captain: Oh, it's good to be home!